"THANK YOU CUSTOMERS AND PITTSBURGH MAGAZINE FOR THIS HONOR!" "My family & I have been patrons of Alfredo's for nearly 10 years now. Joe & Lisa truly compliment each other in their work environment. Lisa does AMAZING work! She always listens to our wants & accomplishes it! I highly recommend Alfredo's for great service, competitive pricing and convenient location." "Been coming here for years. Get hair & nails done. Everyone is great to work with!!!" 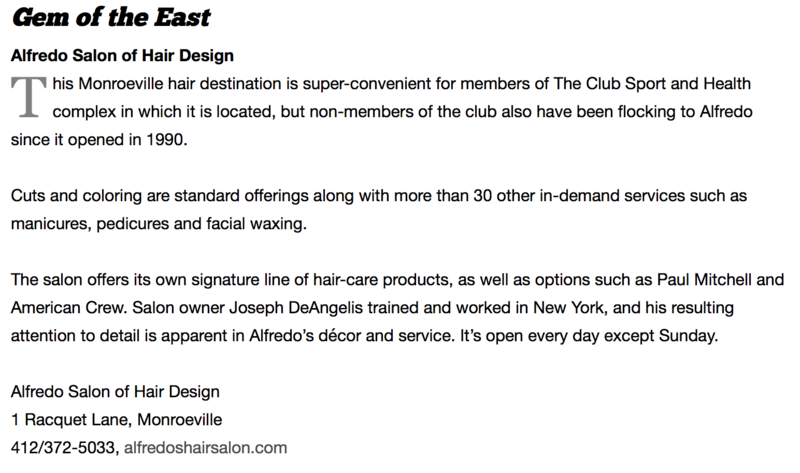 "Alfredo's is my favorite hair salon because of Lisa! I have been a client for over 15 years coming every 4 weeks for a fresh cut and color. Through my many hairstyles and hair colors - Lisa never disappoints! The entire staff makes you feel very welcome and Lisa provides a great experience. This little salon packs a big punch! Joe has a gem in Lisa for hair and Karen for nails!" "I've been going to Karen for 17 years, and she's now not only my manicurist, I consider her a friend. We love playing around with new colors and styles, and I get compliments everywhere I go!!" "Love, Love, Love! Joe has been my stylist for a few years and I have NEVER been happier! Joe is amazing, he listened to my concerns of every hair stylist of the past and made his own recommendation and I will not consider letting anyone else do my hair. They are flexible and accommodating especially with people like me that cant schedule in advance and call and say when can you fit me in??? :) Everyone is talented, but equally as important... nice and fun to be around. "I absolutely love this salon! My stylist Lisa is phenomenal she gave me a fantastic hair color that I love love love!!! Definitely give them a try!!" "I love this salon. They treat you like family." "Karen is the best manicurist/pedicurist in Monroeville! I'm not just a client after all these years we are friends." "One stop beauty shop. I have been going for 17 years. Joe and Lisa have given me the best haircuts, colors and body waves. Women and men stop and compliment me. Karen has always given me a professional manicure. Thank you Alfredos." "I've been going to Alfredo's Salon for years and years, and I sing its praises to anyone who will listen. Not only is the staff talented, friendly, and fun, but all of their services are top notch. Best of all, they have taught me how to manage my difficult hair so that I love it even when I do it myself."